To keep local children fed and ready for school the next day, LA Unified officials are hoping to expand the program that serves dinners to students who remain at school hours after the final bell. Already 76,000 meals a day are provided around dinner time at 584 schools in the district’s After School Supper Program, usually for children who are not picked up until 6:30 or 7 p.m., said Laura Benavidez, Deputy Director of Food Services at LAUSD. Benavidez said the district estimates that more than 140,000 students stay after school in some capacity. Many remain for athletic programs or band practice, or they are part of after-school programs such as Beyond the Bell or LA’s Best. 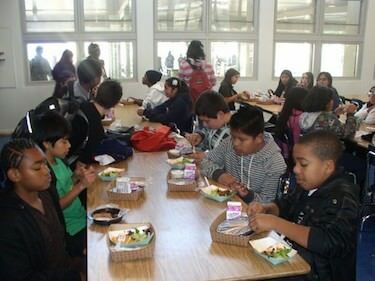 Those are the students whom LAUSD wants to offer meals to, under the guidelines of the national Healthy Hunger-Free Act, which sets healthy guidelines for school meals across the country. The dinners are available for any child between the ages of 3 and 19. “If a child is picked up at school, and there are siblings, they can have a meal, too,” Benavidez said. The meals, according to federal guidelines, have a protein, fruit, grain and dairy component. The district is trying to figure out ways to make the meals more attractive to the students, mostly from low-income communities. Also, the extra federal money that comes from serving the meals at the schools can help pay for the cost of personnel in the after-school programs, Benavidez said.